An overflowing sympathy basket can say what words fail to express. 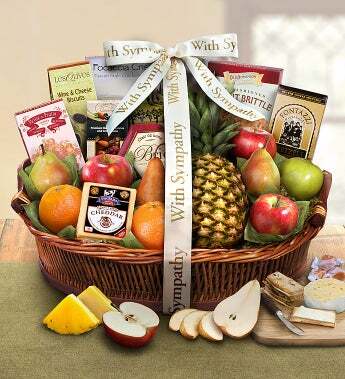 Choose the Sorry For Your Loss woven willow sympathy gift basket and you’re sending a healthy, nourishing gift that includes a selection of pears, navel oranges, a juicy pineapple and seasonal apples. The fruit is hand-picked and hand-packed fresh by the experts at The Fruit Tree™. They’ll appreciate the selection of gourmet cheeses that include a Fiscalini® Cheddar wedge and a Brie Creamy Cheese Spread. Snack on sweets that include Old Dominion® Peanut Brittle and Fontazzi Butter Toffee Pretzels. Simply divine.